Hold on to your hat—or a mule might eat it. There are plenty of high-tech attractions in Yesterland, including the Flying Saucers, America the Beautiful in Circarama, and the Yesterland-Alweg Monorail. But there’s a ride that’s so low-tech that it keeps operating even if there’s a power failure. However, that doesn’t mean it’s always reliable. It can stop for no apparent reason—or for reasons known only to the mules that provide the ride. Let’s compare high-tech and low-tech. The high-tech Indiana Jones Adventure opened at Disneyland in 1995 and proudly featured revolutionary, new ride conveyances capable of random variability. Revolutionary and new? Not really. The low-tech mules provided random variability forty years earlier. Mules are unpredictable. Sometimes they move right along; sometimes they barely move at all; sometimes they just stop; and sometimes they even back up. You never get the same ride twice. You might wonder if you’ll ever make it back to the loading area. Yes, just like the Indiana Jones Adventure. 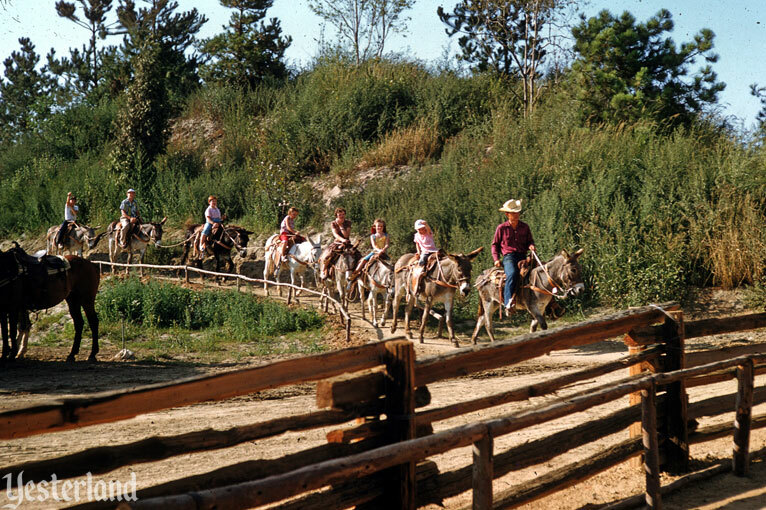 Climb onto a saddle on the back of a mule for a scenic ride across manmade hills, planted with shrubs and pine trees. Pretend you’re in the Old West—the undeveloped West, as represented by a largely undeveloped corner of the park. 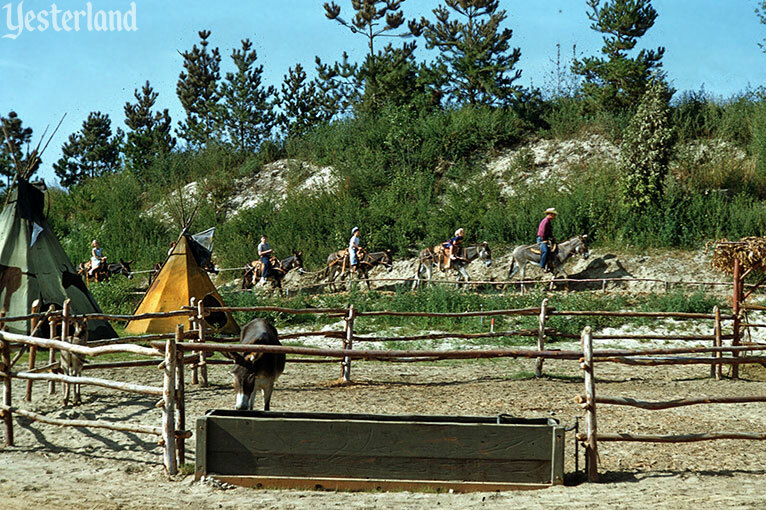 The version of the ride in the three photos directly above is called the Mule Pack. Someday it will become the Rainbow Ridge Pack Mules. But that won’t happen until they build the town of Rainbow Ridge. 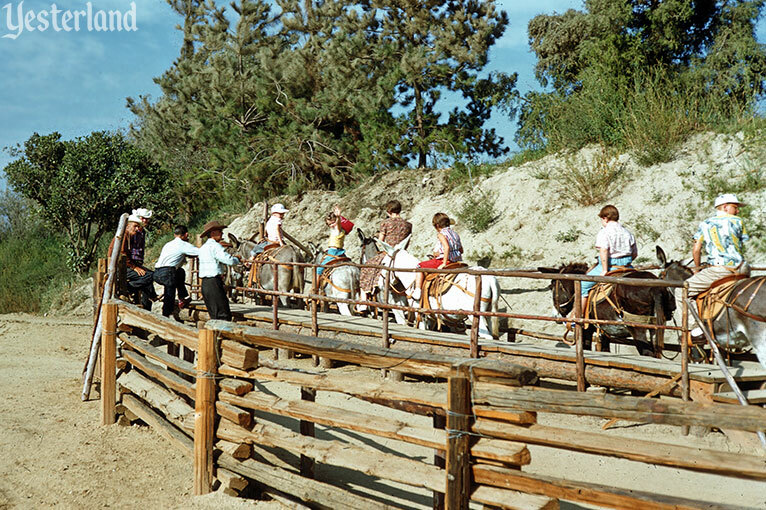 When Disneyland opened in July 1955, the Mule Pack was one of the original attractions. The attraction operated in the same area as the original Stage Coach and the original Conestoga Wagons. The Mule Pack lasted less than a year with its original name and its modest setting. A $2 million Disneyland expansion for summer 1956 included the Disneyland Skyway, the Rainbow Caverns Mine Train, the Indian Village, the Indian War Canoes, Storybook Land, and Tom Sawyer Island. 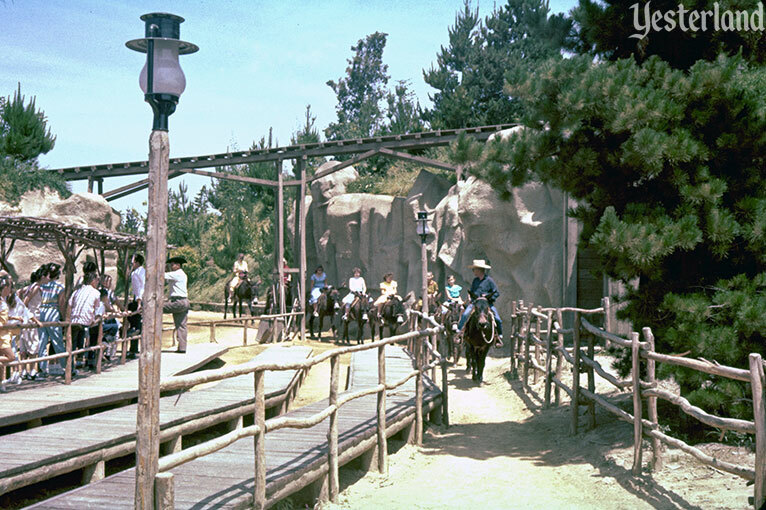 The Rainbow Caverns Mine Train brought the town of Rainbow Ridge, the Living Desert, an enhanced load area for the mule ride, and more for riders to see along the trail. The mule ride became the Rainbow Ridge Pack Mules in June 1956. 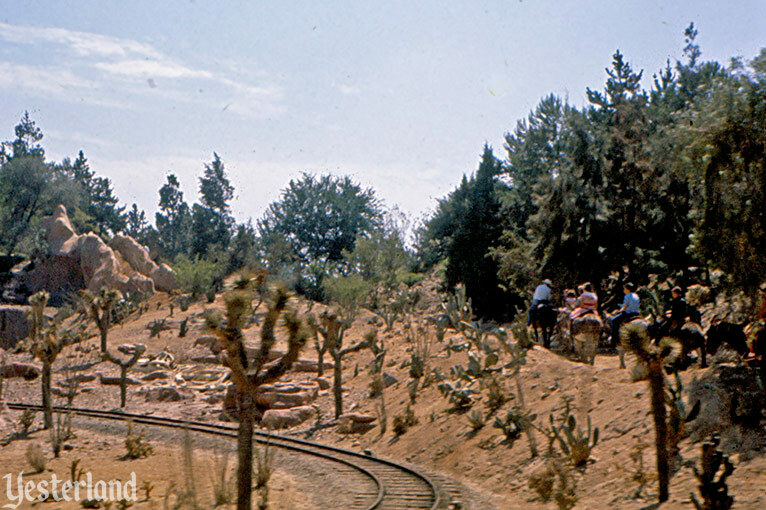 Disneyland guests needed to part with a top-tier ticket to ride on a mule. 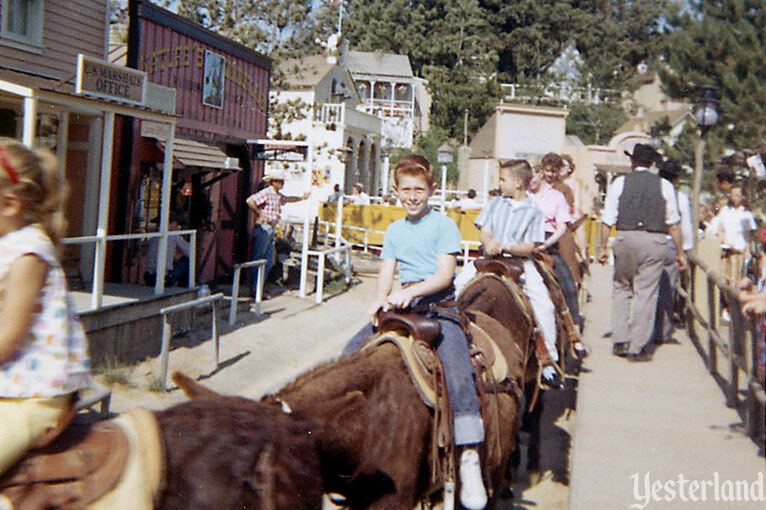 When Disneyland introduced the “E” ticket in June 1959, that’s what the Rainbow Ridge Pack Mules required. The next expansion was in 1960. A $1.8 million transformation turned the 7-acre mule ride and mine train grounds into Nature’s Wonderland. The project included 204 animated animals, 75-foot Cascade Peak, and new environments inspired by Walt Disney’s True-Life Adventures. 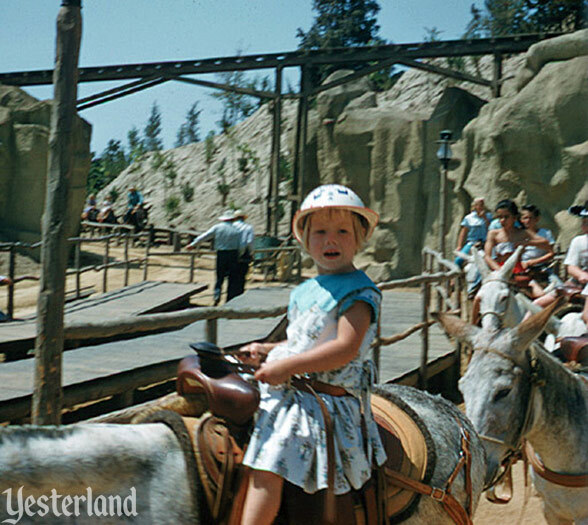 The enhanced mule ride became Pack Mules Through Nature’s Wonderland in June 1960. The mule rides ended in 1973. Nature’s Wonderland was replaced by Big Thunder Mountain Railroad (1979) and Big Thunder Ranch (1986). In 1996, the Big Thunder Ranch area temporarily became the Hunchback of Notre Dame Festival of Fools. Those pack mules must have been the most economical ride system ever developed—in May of 1957, Disneyland bought 25 of the pesky little critters for just $50 apiece! And the daily feed bill for their whole herd of 75? Just twenty cents a head. 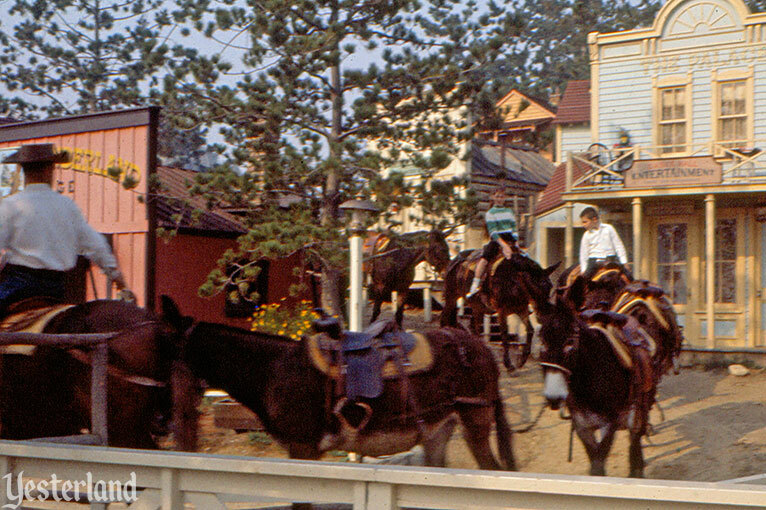 Among Disney parks worldwide, the mule rides were unique to Disneyland. They never were duplicated. The next time somebody tries to tell you that “E” ticket means that a ride is particularly intense and thrilling, bring up the mule ride. Disney Imagineering Legend Bob Gurr did not design Disneyland’s mules. If he had, they would have been more reliable. And more stylish.